A judge in a small city was hearing a drunk-driving case and the defendant, who had both a record and a reputation for driving under the influence, demanded a jury trial. 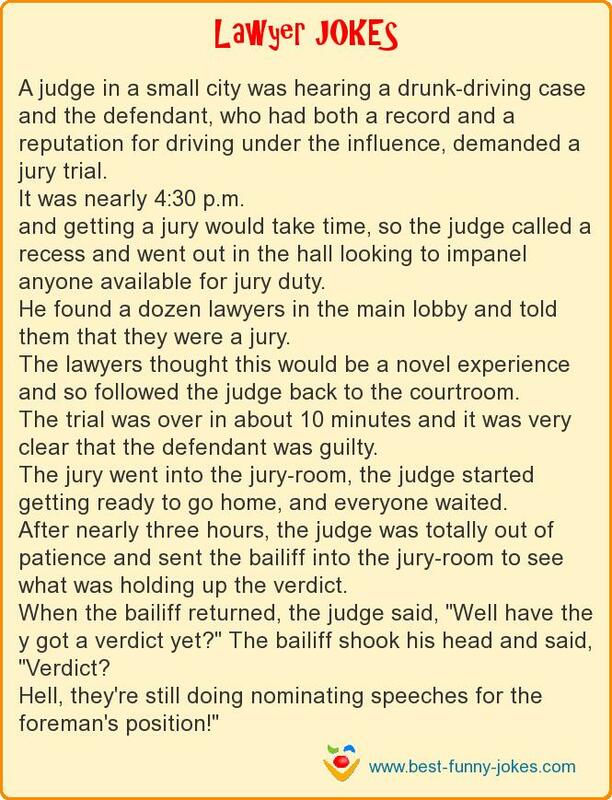 It was nearly 4:30 p.m.
and getting a jury would take time, so the judge called a recess and went out in the hall looking to impanel anyone available for jury duty. He found a dozen lawyers in the main lobby and told them that they were a jury. The trial was over in about 10 minutes and it was very clear that the defendant was guilty. The jury went into the jury-room, the judge started getting ready to go home, and everyone waited. When the bailiff returned, the judge said, "Well have the y got a verdict yet?" The bailiff shook his head and said, "Verdict? Hell, they're still doing nominating speeches for the foreman's position!"